After six years of experience and concerts in various French clubs, FURIOUS ZOO, Renaud HANTSON’s “Big Rock” parallel project, has now got its best line-up. 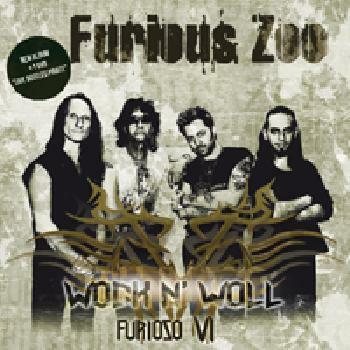 Their sixth album, intitled “Wock N’Woll - Furioso VI”, on sale on april 2012, proves it. It’s probably their most succesfully achieved album. It reveals some of the group’s traditional influences, such as Mr.Big, Whitesnake, or Journey. As a matter of fact, the text of the eponymous title refers to numerous Rock groups or albums. Renaud Hantson’s original idea was to put end to end various titles of big successes which stood out in this musical genre. This album gathers some sinewy songs whose melodies stick in our memories, such as “Eighteen (SexQueen)” or “I Don’t Want To Love You”, a boogie : “Simple Fact of Life”, somme moments of pure Hard Rock with “21st Century Style”, “Higher”, “Jailbreak City”, or “Angel of Dope”, a ballad : “Do You Miss Me”. Most of it was written by the duet Mike Zurita, at the guitars, and Renaud Hantson. Thus, after SATAN JOKERS’s album “Addictions”, they clearly show us both their friendly and artistic complicity and their ability to work in various different genres. Cover lovers aren’t forgotten, since FURIOUS ZOO gratifies them, at the end of the album, with an accoustic version of the famous “Smells Like Teen Spirit” by NIRVANA, in which Julien Loison, the bassist, shares the micro, with a sensitive subtlety, with Renaud Hantson. Recorded six months before she left us, a cover of Whitney Houston’s “I Have Nothing” is a great moment of emotion and a vibrant tribute paid by the singer to one of his favourite vocalists. The group also nods in the direction of Hell’s Angels with the song “Going To the Run” by Golden Earring which celebrates life, biking, friendship, but, unfortunately, death too. In this “Wock N’Woll” album, Renaud Hantson’s voice, is more powerful and “soul” than ever, and perfectly adapted to the style of each song. Once again, Mike Zurita displays his technical ans artistic virtuosity, proving thus that he is probably the best guitar-player in the present circuit. Joe Steinmann, incredible showman, as crazy as The Muppet Show’s drummer, stays firmly at his post. Finally, Julien Loison, the talented new bassist, completes this ideal quartet. This album is meant for Big Rock fans or, simply, good music lovers. No doubt that 2012 will be “Wock N’Woll” and should be very interesting and important for FURIOUS ZOO.